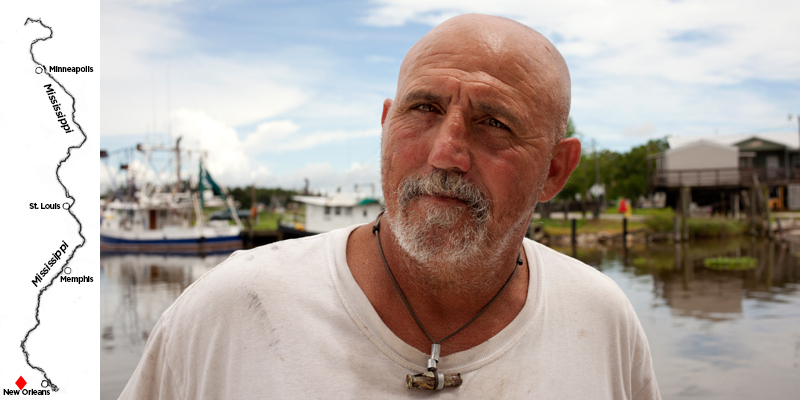 Along a sleepy bayou, in the midst of the lacework of land and water that makes up the coast of Louisiana, Captain Jason Dempster unloads a shrimp boat. He’s spent the last 23 days at sea. “We go out. We pull four 32-foot nets and we look for shrimp, and we go until we find them,” Dempster says. Before each haul, the fishermen first drop a smaller test net to check for shrimp. If it looks good, they’ll let down the big nets and start to trawl, dragging the 32-footers through the water. There are times when Dempster and the other fisherman hit “nothin’” … a dead zone. The dead zone in the Gulf of Mexico is an area of water where the oxygen levels are very low. It usually forms in the spring and summer. “The fish start to thin out and then once you’re on the bottom, you don’t see any fish because they’ve all moved up or moved out of the area,” says Nancy Rabelais, a scientist with Louisiana State University. Each year, Rabelais maps the size of the dead zone. This year, she found 8,776 square miles of low oxygen, the largest on record. That’s about the size of New Hampshire. So what’s going on? Turns out the answer lies upstream. Way, way upstream.